I don’t know if you are familiar with the timeless classic, Les Miserables, a French story written by Victor Hugo, about an escaped criminal who runs from the law, "adopts" a daughter while on the run, and settles down living a very moral and humble life as an "unknown" in a new community. June Bug is a modern-day take on the captivating story of Les Miserables. I first watched Les Miserables when I was in 8th grade, staying up late one evening with my dad. It was a memorable evening because we didn’t have cable television, and decent, well-made movies rarely appeared on tv. He enjoyed explaining some of the portions of the movie to me that I didn’t understand. I was very curious to see how Chris Fabry would interpret Les Miserables into his own story. 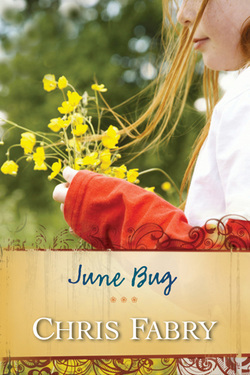 While the modern story, June Bug, has some differences from the old French tale, it also has many similarities. I found the story to be captivating. I couldn’t wait to finish the book! I even read for several hours one Saturday to reach the final page in the book; this is a luxury for me as I rarely read during the evenings or weekends. You’ll find me reading while the girls are at their violin lessons or at youth orchestra rehearsals, and that is about all I allow myself to read for pleasure. Maybe that is going to have to change! After finishing June Bug last Saturday, I had this great feeling all day, clear ’til bedtime, about the book and about being able to sit and read while it was fairly quiet in the house. My daughters, ages 10 and 12, read this book before I did. They really enjoyed the book. My 10-year-old finds it difficult to read books that really capture her attention, but she is now begging me to purchase some of Fabry’s other books. The character development was excellent; the twists and turns in the story kept me captive. I was surprised up to the end of the book, and I shed a few tears when I finished the story. I wish one or two events at the end of the book had resolved in a different manner, but I suppose that was because I didn’t want to cry, LOL. If you enjoy books with good character development, jerks and twists, and that allow you to become very emotionally tied with the plot and characters, you will enjoy this book. It has a pro-Christian theme, which I enjoyed, instead of people’s religions always being slammed as in many modern day books. I am looking forward to reading this author’s other works. Disclosure: I was provided with a free copy of this book for the sole purpose of providing my honest book review. No other compensation was provided.